Today’s piece is a pair of earrings. 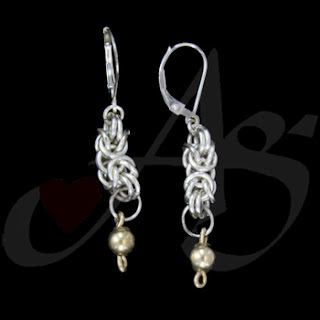 These earrings are made with crystals and pearls on sterling silver hardware. 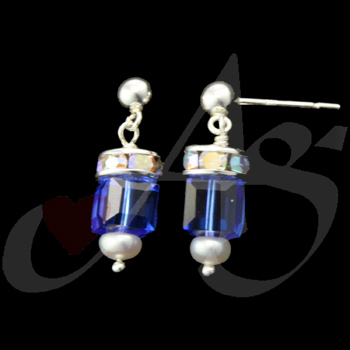 The blue squares are faceted Swarovski crystals, and the smaller set crystals are also Swarovski. 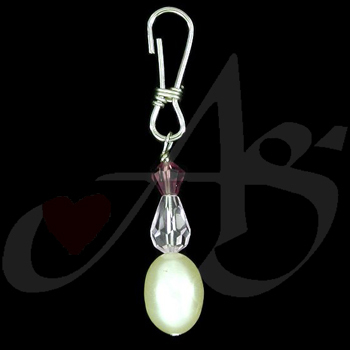 The half-round pearl on the bottom is a white sheen cultured pearl, grade “B”. This piece is no longer available. If you would like this piece, a similar piece, or any unique piece of jewelry; contact us! Don’t forget to stop by our Facebook page, Google+ page, Twitter, or our website for more fascinating pieces of jewelry! Today’s piece is a pair of earrings. 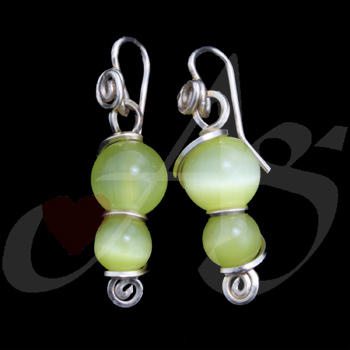 These earrings are made with gold filled 14-karat wire wrapped around yellow fiberglass cats-eye beads. This piece is no longer available. If you would like a similar piece, or any unique piece of jewelry; contact us! Don’t forget to stop by our Facebook page, Google+ page, Twitter, or our website for more wonderful pieces of jewelry. Today’s piece is a zipper pull. This zipper pull is made with brass hand-cut and hand stamped sheet metal and brass wire. Hanging from the bottom of the brass tab is a coral brick. This piece is currently available. If you would like this piece, a similar piece, or any unique piece of jewelry; contact us! Don’t forget to stop by our Facebook page, Google+ page, Twitter, or our website for more unique pieces of jewelry. Today’s piece is a lapel pin. 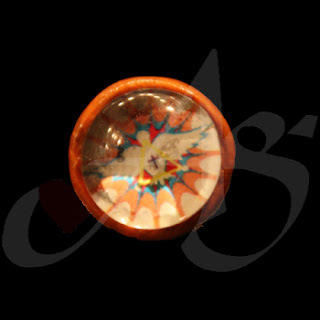 This lapel pin is made with polymer clay and a glass cabochon. The image is transferred onto the clay using a special technique here at Agape Gifts, the same technique we use for transferring images to bracelets and Rosaries. This piece is currently available! If you would like this piece, a similar piece, or any unique piece of jewelry; contact us! Don’t forget to stop by our Facebook page, Google+ page, Twitter or our website for more exquisite pieces of jewelry! Today’s piece is a Rosary bracelet. This Rosary bracelet is made with rose quartz and amethyst. 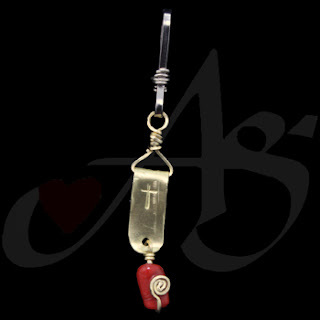 Between each of the quartz “Hail Mary” beads are smaller, ‘button’ crystal quartzes. This piece is strung on steel wire with a 26-pound breaking weight. This piece is currently available! Today’s piece is a rosary bracelet. 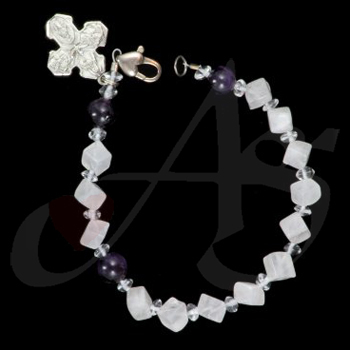 This Rosary bracelet is made with US-made glass beads. The bracelet is relatively light, because of the glass; compared to, say, made with precious stones. This piece would go wonderfully with any outfit. Because of the diamond-cut “Hail Mary” beads, this bracelet is even a bit edgy. This piece is currently available. Today’s piece is a pair of earrings. These earrings are hand made, hand cut, and hand pounded. The top circle is made from nickel sheet metal, and the lower circle is made from brass sheet metal. This piece is currently available! If you would like this piece, a similar piece, or any unique piece of jewelry; contact us! Be sure to stop by our Facebook page, Google+ page, Twitter, or our website for more wonderful pieces of jewelry! Today’s piece is a rosary bracelet. This bracelet is made with sterling silver beads and blue Chinese Crystals. The Our Father beads are etched .925 sterling silver balls. 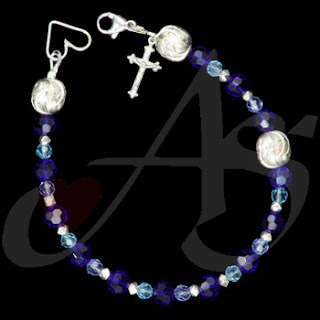 The Hail Mary beads are the dark blue faceted Chinese crystals. The light blue Chinese crystals, and the smaller silver faceted squares, are used as decorative spacers in this bracelet. This piece is currently available! Today’s piece is a tire chain. This piece prevents you from having to pierce your tie. This particular tie chain is made with hand twisted brass wiare, and a large ceramic bead. This piece is currently available! If you would like this piece, a similar piece, or any unique piece of jewelry; contact us! Don’t’ forget to stop by our Facebook page, Google+ page, Twitter, or our website for more great pieces of jewelry! Today’s piece is a bracelet. 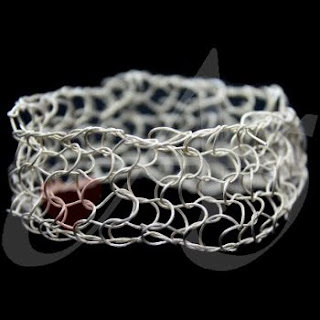 This bracelet is made with hand knitted brass cable wire. This bracelet is also adjustable by simply gently stretching or constricting the bracelet as a whole. This piece is no longer available. If you would like a similar piece, or any unique piece of jewelry contact us! Don’t forget to stop by our Facebook page, Google+ page, Twitter, or our website for more amazing pieces of jewelry! Today’s piece is a zipper pull. This zipper pull is made with a purple and a clear teardrop Japanese crystal with a large faux pearl on the bottom. This piece is currently available. Today’s piece is a zipper pull. 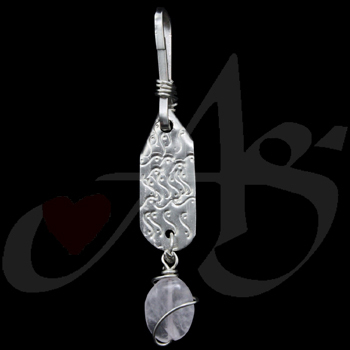 This zipper pull is made with nickel sheet metal and a rose quartz bead. The nickel sheet metal is hand cut, and hand stamped. The rose quartz is hand strung and wire wrapped by hand with nickel wire. This piece is currently available. If you would like this piece, a similar piece, or any unique piece of jewelry; contact us! Don’t forget to stop by our Facebook page, Google+ page, Twitter, or our website for more splendid pieces of jewelry. In recognition of the snow we received over the weekend, it is only fit our piece of the day is a snowman. This snowman pin was made from straight nickel wire, and like frosty, formed to life. This piece is currently available. If you would like this piece, a similar piece, or any unique piece of jewelry; contact us! Don’t forget to stop by our Facebook page, Google+ page, Twitter, or our website for additional jewelry and bonus content! Today’s piece is a ring. This ring is made with hand twisted square sterling silver wire. This piece is no longer available. If you would like this piece, a similar piece, or any unique piece of jewelry; contact us! 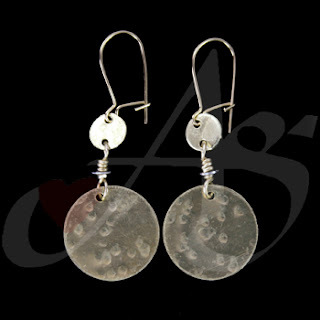 Don’t forget to stop by our Facebook page, Google+ page, Twitter, or our website for more distinctive pieces of jewelry! Today’s piece is a pair of earrings. 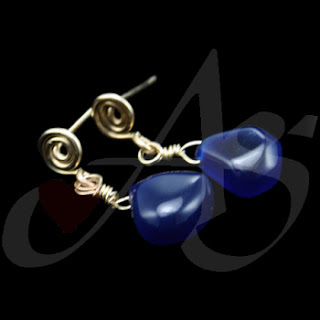 These earrings are make with 14/20-karate gold filled wire and teardrop dark blue chalcedony. All the hardware for this piece was made from straight pieces of wire, and hand twisted into the beautiful piece of jewelry you see here. This piece is no longer available. If you would like a similar piece, or any unique piece of jewelry; contact us! 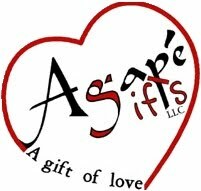 Don’t forget to check out our Facebook page, Google+ page, Twitter, or our website for more exquisite pieces of jewelry. Today’s piece is a pair of earrings. 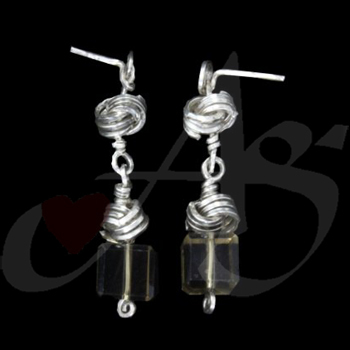 These earrings are made with hand twisted sterling silver and Chinese crystals. 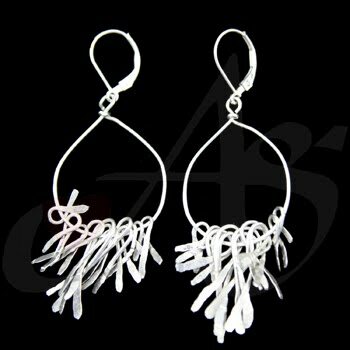 The sterling silver knots were hand tied, and hand linked. Everything here, from how the crystal is attached, to the earring post is hand made from a straight piece of sterling silver wire. This piece is no longer available. If you would like a similar piece, or any unique piece of jewelry; contact us! Don’t forget to stop by our Facebook page, Google+ page, Twitter, or our website for more wonderful pieces of jewelry! Today’s piece is a pair of earrings. These earrings are made with sterling silver links and gold balls. The sterling silver links were individually made on a Jump-Ringer™, the links were then inter-connected with each other to form the chain link patter, seen here. The gold ball on the bottom is a gold Bali ball on gold-filled wire. This piece is no longer available. If you would like a similar piece, or any unique piece of jewelry; contact us! Don’t forget to check out our Facebook page, Google+ page, Twitter, or our website for more great pieces of jewelry! Today’s piece is a pair of earrings. These earrings are made with sterling silver pieces of wire. 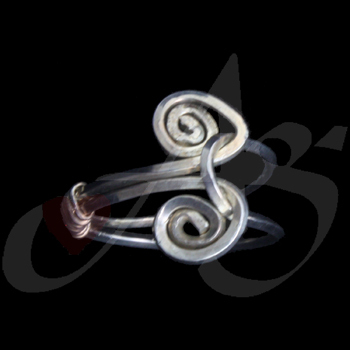 The sterling silver ribbons were handmade, hand pounded, and hand textured. This piece is currently available! If you would like this piece, a similar piece, or any unique piece of jewelry; contact us! Don’t forget to stop by our Facebook page, Google+ page, Twitter, or our website for fabulous pieces of jewelry! Today’s piece is a ring. This ring is made of brass and a lamp-work bead. The band of the ring was hand cut out of brass sheet metal. 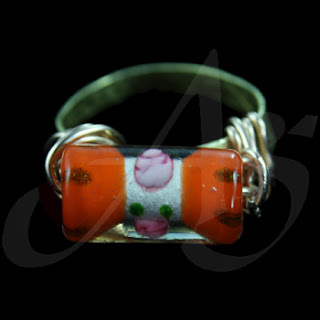 The bead was then hand wrapped to sit on the band. This bead was made in Italy. This piece is currently available! Today’s piece is a pair of earrings. 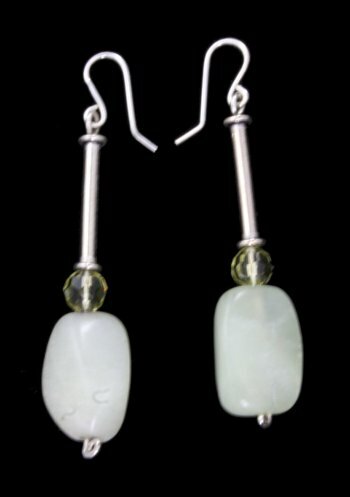 These earrings are made with green aventurine, yellow Chinese crystals, and sterling silver tube beads. This piece has a wonderful shape design with the smooth feel and color of the aventurine. This piece is currently available! If you would like this piece, a similar piece, or any unique piece of jewelry; contact us! Don’t forget to stop by our Facebook page, Google+ page, Twitter, or our website for more jewelry with personality! Today’s piece is a necklace. This necklace is made with pearls and crystals. The pearls are white half, round pearls and a green, almost black, cultured pearl. The crystals are Swarovski and separate the pattern of pearls. The pendant was initially designed to hold eyeglasses, however it can be used, or represent, for whatever you wish! This piece is currently available!